Our management team brings a wide array of talents and experiences to the table to achieve a common goal: helping our agents and clients assess and achieve their financial goals. The agents at New York Life El Paso provide individuals and families with innovative, cutting-edge products and services to help them grow, protect and conserve their wealth through all stages in life. Taking into account your needs, goals and tolerance to risk, we will work with you to bring clarity to where you’re going and how to get there. Can you make a very comfortable living as a New York Life El Paso financial professional? Absolutely. It’s one of the top reasons agents like working for us, along with camaraderie and support. New York Life El Paso hosts many great events and educational opportunities for agents, clients, and the community. Check out our event calendar to stay in the loop with what’s going on. The New York Life El Paso general office is located in Suite 1100 on the 11th Floor of the Anson Mills Building at 303 N. Oregon St., El Paso, TX 79901. The Anson Mills Building is located in the heart of Downtown El Paso next to the historic San Jacinto Plaza. Here at the New York Life El Paso office, we believe that success is best achieved by helping others to succeed. That core value is evidenced in the service and support we offer to the people who work here and the clients we serve. Whether you’re a financial professional looking to take your career to new heights or a potential client looking to grow, manage and protect your assets, you can rest assured that you’ll be in good hands by partnering with a company built on 170 years of strength and security. As a financial professional at the New York Life El Paso office, you’re part of an extensive career agency system. That means we provide you with all the guidance, support, and resources you’ll need to do what you do best: serving your clients’ needs. From our outstanding training program to our robust compensation package, there are so many reasons to join our team. How certain are you that your future financial needs are well taken care of? 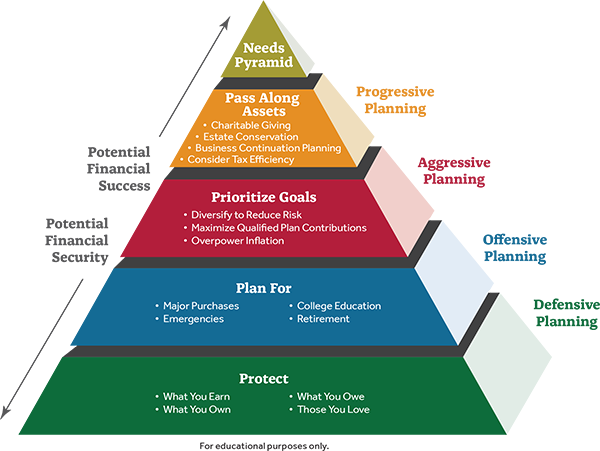 We utilize a proprietary tool, the Financial Needs Analysis Pyramid, to help our clients assess their current financial health, identify their short and long-term goals, and chart a course to help them protect their assets and plan for the future.